BROOKLYN — A pregnant woman was killed when a construction vehicle clearing snow struck her in a Brooklyn supermarket parking lot Thursday morning, police said. Doctors were able to save her baby boy. Min Lin, 36, was loading groceries with her husband into their car behind the Fei Long Market when a Bobcat driven by the business's owner backed into the woman, sources said. The plow driver, Chun Wu, 42 had just dumped a load of snow in the parking lot near the woman's car at Eighth Avenue between 63rd and 64th Streets about 10:45 a.m. before reversing into the woman, according to officials. Lin's relative said that the owner knocked her down and drove over her. The woman was rushed to nearby Maimonides Hospital where she was pronounced dead. Doctors performed a Caesarean section birth and were able to save the child, who is currently in critical condition, sources said. Wu was issued a summons for the accident, but police did not have further details. A nurse at the hospital said that infant was "pretty critical." 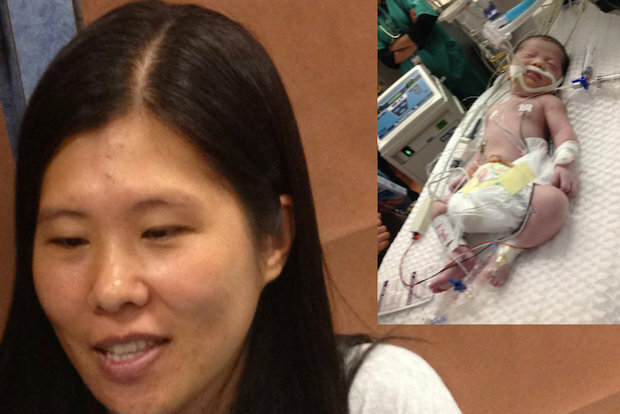 The child was deprived of oxygen for 17 minutes before it was delivered, Lin's uncle, Xiao Lin Zhang said. "Right now, we don't know what's going on in the baby's brain," said the nurse, who did not give her name. The couple had dropped their 6-year-old son off at school this morning, then gone to Manhattan for an OB/GYN check up. They stopped off at the supermarket to pick up some groceries when she was struck. The woman's husband, Jin Feng Lin, a restaurant worker, hung his head as he walked out of the hospital Thursday evening. The couple, originally from China, have been married for seven years and have a 6-year-old son, Zhang said. "He's very sad," the uncle said. Neighbors said that the Bobcat operator is known for his reckless driving. "He just drives crazy," Linda Perez, 42, a homemaker who lives across the street. "We know not to cross the street when there's snow." She said that she's seen the market owner drive on the sidewalk and in the street. "He just drives in circles. He doesn't look," she said. "We scream at him sometimes, 'Watch out.' He doesn't pay attention." There were no arrests made after the collision and the investigation is ongoing.